If you want to offer products for sale, there are some additional steps, described here. Adobe Exchange offers producers two different payment methods: perpetual and subscription. A perpetual product requires the user to pay a one-time fee in order to acquire it. A subscription product can be paid for on a monthly or annual basis. You set the price that the user will pay each month or each year in order to use your product. Log into the Producer Portal, click the down arrow by the user icon in the top right corner, and choose Account from the menu. Click the FastSpring Registration link. This takes you to the sign-up page on the FastSpring web site, where you must enter all of the required information and submit the form. When FastSpring has processed your request (which can take up to 72 hours), you will receive an email with your Payee account login information, including the company name that is associated with your FastSpring account (which might differ from the company name you provided in your Adobe Exchange account profile). Return to the Account page in Adobe Exchange Producer’s Portal. Enter the company name assigned by FastSpring as the FastSpring Key and click Submit. When you have verified that you can log in to FastSpring and have accepted their terms, you can set up the rest of your payment information in the FastSpring system. When the first paid transaction occurs, FastSpring verifies your account information. 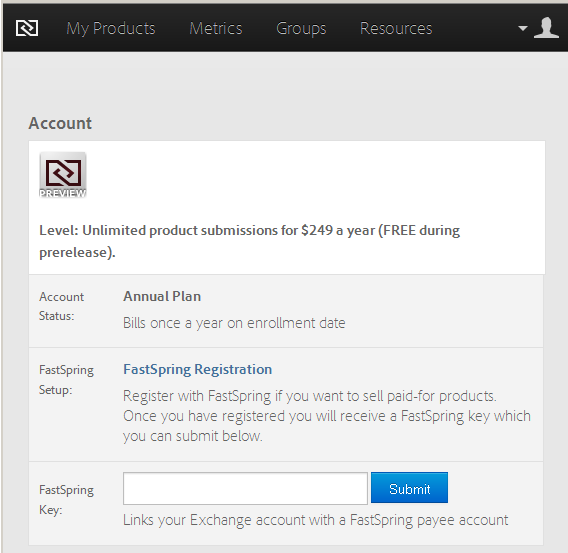 Once you have set up your FastSpring account, create your product as described in Getting Started with Adobe Exchange. Note that when you are filling in the product information, you must enter a non-zero price. The minimum price for a paid product is $5.00. Once you have created a paid version of a product and it has been successfully published, you can create and offer to your users a free trial version. To create the trial version, you must create, upload, and submit a separate product. You can do this only AFTER you have submitted the full paid version of the product. You can create patch updates for the trial version of your product, just as you can for the paid version. For more information, see Managing Products After Publication. When a user is browsing for products to buy, products with trial versions have a trial-version icon next to the paid-version icon in the Products list of the Exchange panel. On the Product Info page, the user has the option to either Try the product for free or purchase it. When your paid product has been successfully published, the Product Info page offers you the Create Trial button. Click to add a trial product offering. This opens a new page where you specify the location of the ZXP package file, and enter a summary and description for the trial version. Click Save Trial. You automatically return to the Trial Info page, which shows you the current details and allows you to submit the new trial version. When you have both a paid version and a trial version of your product, the Product Info and Trial Info pages each have Trial Info/Product Info buttons that allow you to toggle between them. Preview and test the trial version if you want, as described in the next step. When you are ready, click one of the Submit options to submit the trial version for approval. 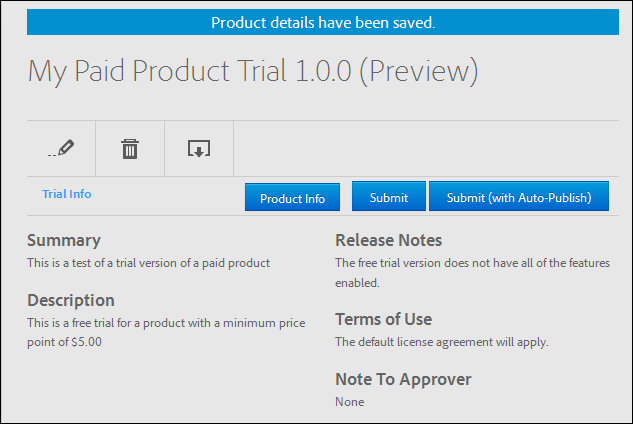 You can preview and test the trial description in the Adobe Exchange panel before submitting it for approval. Open the Exchange Panel in the Creative Suite application by choosing Window > Extensions > Exchange. You can see both the paid version and the trial version of your product in the My Stuff tab. Click the trial product to see the full product details, including Buy and Try buttons. On the Info tab, you can see the descriptions of the paid and trial versions of the product. Make sure the trial description looks good in both the narrow and wide views. You can download the ZXP and test it directly from the MyStuff tab, or by clicking Try from the Product Info page. The paid version and the trial version of your product must be submitted individually for approval. When you click Submit or Submit (with Auto-Publish), Adobe Exchange uploads and validates the package the same way it does for the paid version of the product. The bundle ID of the trial product must match that of the paid product. 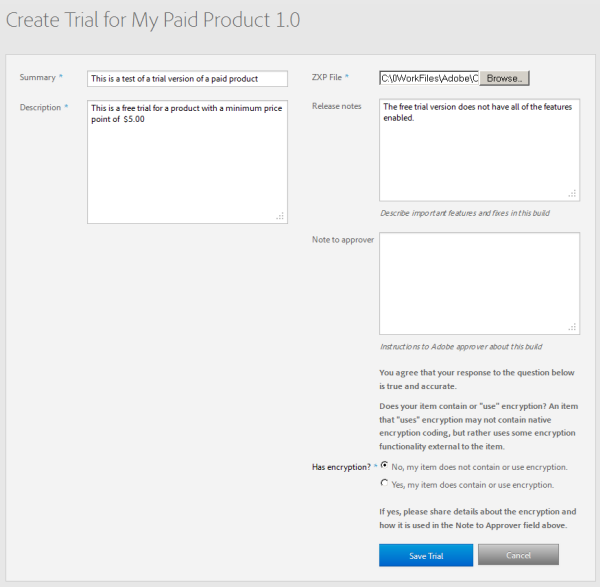 For example, if the paid bundle ID is “com.mycompany.myproduct”, the trial bundle ID is also “com.mycompany.myproduct”. The version number for the trial version must end in the string “.trial”; for example, “1.0.0.trial”. The product compatibilities must match those of the paid product. Validations applied to the main build must also apply to the trial. Note: Currently, Adobe Exchange does not manage time-limited trials; the producer is responsible for building in any time and usage restrictions. As a producer, you might want to incorporate copy protection, DRM, or licensing schemes into your products. Adobe Exchange can currently accommodate licensing schemes in which an activation key, serial number, or license number is sent to the user, and the user enters the key to unlock the extension. We offer the ability to send license codes out via FastSpring on behalf of the producers in order for users to activate a product. We ask that producers who have incorporated any licensing into their product send us a list of serial codes or a serial URL during their product submission, and we will in turn enter these into FastSpring. For each sale that is made via FastSpring, an email with the serial code is generated and sent to the user. You can integrate a third-party licensing scheme for DRM and still sell the product through Adobe Exchange, if your chosen DRM solution allows you to send the customer a license number by email. You, as producer, are responsible for implementng your chosen licensing scheme. There are third-party tools and libraries available to help with this. You can send a simple list of valid license keys to Adobe. Each license key is used once, then removed from the list. FastSpring stores the list of keys. You can set up a web service to generate valid keys, and provide Adobe with the URL and authentication details. You host the web service. You can choose to use a third-party license key generator from one of the supported vendors: SoftwarePassport, Aquatic Prime, CocoaFob, or GameShield. In each of these cases, FastSpring emails the license key to the customer as part of the purchase process. Setting up the pool of license numbers is a manual process that must be carried out by Adobe. If your product already includes a license number scheme and you would like FastSpring to provide your customers with license numbers, please contact avetting@adobe.com before submitting your product for review, or enter details in the ‘Notes to Approver’ during product submission. You can also enter the list of license keys or the license generation URL in this section. If you have your own license generator, FastSpring makes POST requests to the URL you provide to generate license keys for your products, using UTF-8 encoding. Do NOT send back a formatted XML response.